Let Yarra City Council know you support a Copenhagen bike lane for Wellington St – fill out the survey here. The City of Yarra is now consulting the community with a proposal to construct a Copenhagen bike lane between Johnston St and Victoria St. Consultation includes an online survey, an information booth in Wellington St for local foot/ cycling traffic and local workers/ businesses, and a community info session in the Reading Room at the Fitzroy Town Hall. Please contribute to the consultation and support improved cycling infrastructure in Yarra. To download the petition calling for more Copenhagen lanes in the City of Yarra click here. Yarra Council has some interesting ideas. One of which is that painting a road equals building a bike lane. Like some magic talisman, the painted lines will protect you. There seems to be a fundamental disconnect between what an average person on a bike would call a bike lane and what the Yarra Council thinks a bike lane is. Call me crazy but when I read that Council wants, “Yarra to be the best cycling city in Australia with the highest mode share for cycling to work, schools, shops of any city in Australia”, and “to have an effective interconnected, continuous and well maintained bicycle network that inexperienced and experienced riders feel safe and comfortable using”, I don’t think of some paint and rubber on the road, it just doesn’t achieve that for me. Now those objectives are entirely commendable and I for one would love to see Yarra Council achieve them. I have an image of people happily jumping on their bikes to buy some milk or take the kids to soccer training as just a normal part of practically everyone’s life. 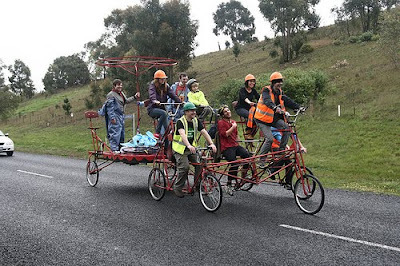 “In mid 2011, Council constructed a new bicycle route that connects Heidelberg Road in Clifton Hill with Gipps Street in Abbotsford. “The route provides a separated road space for cyclists that connects cyclists to other key bicycle routes and provides better access to other parts of Yarra and the CBD. Frankly the $280,000 does not equal “a separated road space for cyclists” it has put some paint and rubber on the road. It is spin doctoring to call that “separated”. It is time to call it what it is, dangerous window dressing that continues the second class status of cyclists and puts them in harm’s way, while pretending to provide them with a bike lane. If like me you have used that route you will know that you take a punt with your life every time you turn from Bath Street into Johnston St to get onto Gipps St and I pray that someone doesn’t have to get killed there before a real solution for cyclists crossing Johnston Street is put in place. There is a profound double standard that applies to cyclists. Cyclists incidence of injury and death is increasing and it is justified as a consequence of increasing numbers of cyclists in the community. But that would be totally unacceptable for motorists. The death toll must go down every year for motorists, even though there are more on the roads and rightly so. We should have safe roads for all the people who use them. But cyclists are getting a bum deal and it is time to face that fact. The TAC website shows that for the year to date there is a 67% increase. Even an innocent momentary lapse of concentration on a motorist’s part and splat, cyclist’s Christmas cancelled. Which is why, if Yarra is to become “the best cycling city in Australia” it will have to become the highest funding per capita Council in Australia and build physically separated bicycle lanes that are safe to travel in. Thankfully Yarra has some great natural advantages in that contest. We have a geographical small council, we have many broad streets and we have a lot of cyclists already. So let’s grab the mantle off Sydney and just do it, build (not paint) a great network of real bike lanes, ones that physically separate cyclists and motorists, like the Copenhagen style does, and build new bike paths that cyclists of all ages and ability feel safe using. When Yarra starts doing that, rather than acting like a graffiti artist on our road running wild with paint, then we will increasingly feel like the roads are safe for cyclists and many more will jump on a bike. Yarra cannot fix the problem of the entire city, but Yarra can certainly lead the way for the entire metropolitan area. In the meantime cyclists will continue to protect parked cars from damage with their lives rather than parked cars protecting cyclists’ lives. How many people have to be injured or killed on Yarra’s roads before a cyclists’ life is more valuable than a parked car? So I for one am just going to have to disagree with Yarra Council and continue to say that there are no new bike lanes in Yarra and it doesn’t look like there will be any in the near future. Not while they are still thinking a bit of paint creates an on-road bike lane. That’s just not good enough, not when people’s lives are at stake. People who have been road riding for some time tend to develop an acceptance of the risks, they develop strategies to cope with it. I for one, light up my bike like a Christmas tree at nights on the road. However, we tend to forget that it is scary and off-putting for most people to use your bike on the roads with cars zipping past you just centimetres away. Victoria Police’s Operation Halo demonstrates that the magic paint just doesn’t work to keep cyclists and motorists separated. “More than 130 motorcyclists have been snared for riding in the bike lane, as have 42 car and truck drivers” during Operation Halo. The Age recently had an article that highlighted just how scary it can be out there on the roads. So come on Yarra get your act together put away the paint brush and build real bike lanes. Are cyclists the real heroes? Some of YCAN’s best friends are cyclists. Cycling is a fantastic way to get some exercise, zip around Yarra and do your bit to have a smaller carbon footprint. But shockingly the City of Yarra has been identified as one of five high risk municipalities for the Victorian Police’s Operation Halo which has been running over the last few weeks. It is also disappointing that the Council is being very slow to properly implement its bicycle strategy. Operation Halo has seen about 100 police a day working across the Melbourne, Port Phillip, Yarra, Boroondara and Stonnington Police Service Areas (PSAs) during peak commuter times at high-collision locations. YCAN believes that cyclists deserve the opportunity to cycle around Yarra without running the gauntlet. Cycling deserves to be a normal part of our lives in Yarra. It takes up a tiny proportion of the space that cars do, making the roads less congested for those who have to use motor vehicles. We all want to know that the ambulance is not going to get stuck in gridlock when we call it, cyclists leave the road clearer. Police have detected 3943 offences which could have contributed to pedestrian, cyclist and motorcycle road trauma in the first three weeks of Operation Halo. “Our road toll is currently 47 – that’s 15 higher than this time last year. Of those deaths, four have been cyclists, five pedestrians and six motorcycle riders.” Sgt Lavos said. It isn’t surprising that motor vehicles make up the majority of the offences. What is surprising is that means 8.5% of those deaths were cyclists. It seems a disproportionate number of cyclist have died in that period. We are not saying that it is the fault of motorists. What we are saying is that both motorists and cyclists deserve the opportunity to travel safely and that having separate bike lanes in the Copenhagen style will make travelling safer for everyone. This is a failure to provide the infrastructure that the huge increase in cyclists calls for. The City of Yarra has a Bicycle strategy that should have meant that our community got five Copenhagen lanes per year. As yet the City of Yarra has failed to provide even one. How many people will be injured or die before Yarra Council starts to meet this modest target? Would the Police have needed to deploy one hundred officers if our community was safer for cyclists? If you are a cyclist or have someone you love who enjoys cycling then this affects you. Let’s make cycling safer. And let’s solve gridlock before it strangles our city. It is time for Council to stop thinking that some white lines and green paint will protect the people of this city. Everyone is a winner when more people regularly cycle, unless it ends in tears. YCAN calls on the City of Yarra to fully implement its bike strategy and show genuine leadership by becoming the highest per capita funder of cycling infrastructure in Australia. Last night some of YCAN’s Local Action Group went to the Yarra Council meeting at Richmond Town Hall. We were there for two reasons. Firstly, in Public Question Time, we wanted to ask if the Community Gardens Committee (which has Yarra resident members) would be continued next year. We’d heard a rumour that funding for community gardens was one of the things that the councillors who are pushing to build a $35 million indoor sports centre were keen to axe. YCAN is a strong supporter of community gardens where vegetables and fruit trees can be grown. Our second question was if Council could assist residents in approaching owners of vacant private land with a view to using it for community gardens. The response was a masterful example of saying a lot, telling us nothing we didn’t already know, and not actually answering the questions. We’re use to it. Undaunted, we will keep a close eye on the situation with regard to community gardens in Yarra. The second reason we were there was to support Council on their submission on the Dept. of Transport’s proposed peak hour bus lanes along Hoddle St and Victoria Pde. Council is critical of the plan which lops off some of the central median, removes parking, but doesn’t actually reduce the number of lanes available to cars. We also wanted point out that no provision for bikes had been made in the plan. Councillors agreed that this omission should be rectified. An amendment was proposed and passed unanimously. So job done, no opposition, all over and done with in a matter of minutes…not exactly. We arrived at 7pm as Public Question Time is early on the agenda. We had done our bit by 7.30. The Hoddle St/Victoria Parade Bus Lane was later on the agenda, much later. It was almost 11pm by the time it came up. In between there were a couple of contentious planning issues, where passionate residents were able to voice their opinions. Councillors listened to their concerns, asked questions, debated the issues. Amendments were proposed, voted down, new ones proposed, etc. It was a long process, but a fascinating one. We left at 11pm, but the councillors still had half of the agenda to go. If you’ve never been to a local Council Meeting, you should go. It’s much more entertaining than CSI Alaska or My Cooking’s more Pretentious than Yours. It’s democracy at work, and you can take part in it. We just wish the chairs were more comfortable. The City of Yarra’s Draft Bicycle Strategy is open for public review and comment until 22 October. The document includes actions that will aim to increase the mode share of cycling for trips in Yarra, with a long-term vision of making cycling the first transport choice for all short to medium distance trips. It details actions and timelines for improvements to the on and off road bicycle network and other infrastructure (including bike parking facilities) to maximise bicycle use in Yarra. The draft strategy sets a clear goal for Council to increase the rate of Yarra residents cycling to work from 6.4% to 15% by 2015 as well as reducing bicycle collisions and injuries. It also aims to encourage people of all ages and backgrounds to take up cycling as a mode of transport. Increasing cycling is a major part of the necessary transition to zero emissions transport systems. If Yarra Council carries out the actions in this plan, they will most certainly help in increasing cycling and should be commended. It would be great to see other municipalities and the State/Fed Governments make similar commitments backed by tangible actions. Send submissions through to Mark Kulyk at mark.kulyk –at– yarracity.vic.gov.au or PO Box 168, Richmond, VIC, 3121.